Fünf is German for “five” and a fun name for this 5-pointed star-motif tangle pattern from Albuquerque, NM, CZT® Denise Rudd. Denise started with a Y-shape, “decided to add arms and an aura, and there were my stars, and they were pretty consistent.” For those of you similarly star-challenged, Denise’s steps will having you seeing stars in no-time flat. Fünf has a lot of potential for variations within and around the star shapes. 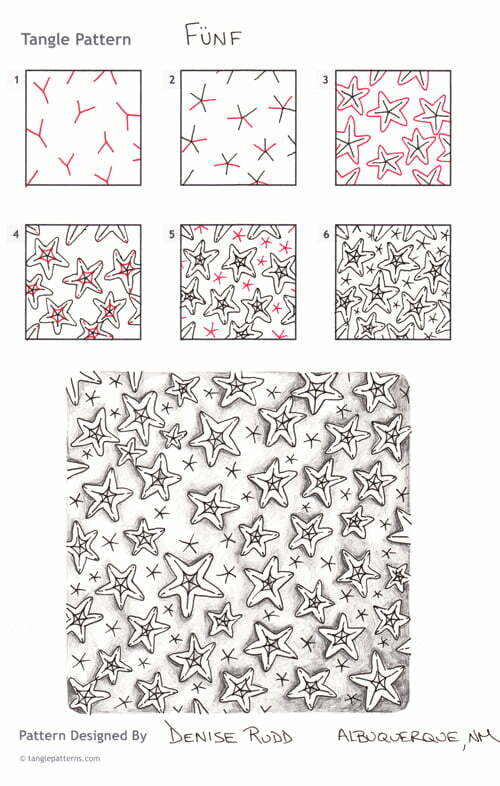 Here are Denise’s step-by-step instructions for drawing Fünf and a monotangle example of her tangle. Check out the tag deniser for more of Denise’s patterns on TanglePatterns.com. Cute pattern. Reminds me of star-fish.